Portsdean Technical is a family run firm established since 1964 and we are based in Fareham but cover an area spanning Bognor, Bournemouth up to Alton. All our engineers are experienced, maintain a good dress sense, have clean vans, carry dust sheets, respect people’s property and have a professional attitude. We are experienced in working for private customers, manufacturers, landlords and letting agents. We are the chosen partner for the following major boiler manufacturers in respect of discharging all of the warranty work in south-central area from Bognor to Poole and up to Alton. Viessmann, Fondital, radiant, Biasi, Alpha Innovation and Ariston MTS are all manufacturers that we work closely with. Our engineers are qualified in all aspects of domestic gas work including LPG, cookers, warm air units, space heating, gas fires and of course all types of gas boiler. We have been chosen by the manufacturers above, mainly because we heavily invest in training our engineers. With the addition of Solar and the training in air source heat pumps we can now also offer a renewables package to our customer base. 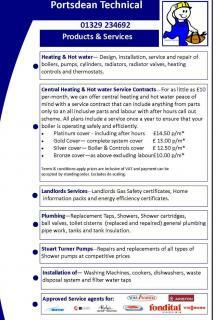 As a company we import and distribute boilers and radiators to the trade. We run a full gas boiler spares outlet in Fareham and also import and distributes gas spares to local and national companies. This enables our service agents to guarantee the best price for the spare parts needed for the repair of gas appliances. Portsdean Technical can offer everything from a service contract including a boiler service to the design and installation of complete systems. We also offer an emergency call out service for our customers.